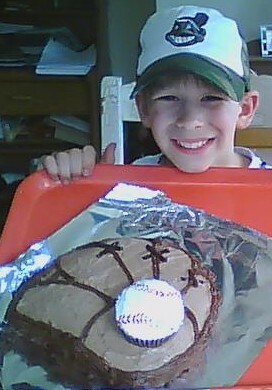 I made this baseball glove and ball cake for my son, Ben, on his birthday. He's really loving baseball at the moment. His team just played and won their first game! I just used a regular cake mix and cooked half of it in a round cake pan and poured the rest in cupcake holders. For the main icing, take one cup of milk and add a chocolate pudding mix to it one cup of Cool Whip. Ice the entire cake. I then used a toothpick to draw the leather stitching before I started decorating with some basic chocolate icing, (always nervous about my drawing abilities!). To make it easier to draw, cut a hole in the bottom corner of a baggie and put the chocolate icing in there to squeeze out easily. Ice the sides and leather looking parts. The recipe called for chocolate sprinkles but my hand is not as steady as it used to be so I opted for icing it all. I did use chocolate licorice for the leather strings. I used the rest of the Cool Whip to ice the cupcakes and then added the red string lines at the end. You just place one cupcake at the right spot and there you have it. I hope some of you will enjoy making this baseball glove and ball cake for one of your baseball loving kids or even your hubby!